January and February always seem to represent a low time in the year. Christmas and New Year have been and gone and there seems little to look forward to. The days remain short and the nights long. It’s usually raw cold. Unwelcoming. The opening months of the year always cause something of a gloom to hang over Mick Miller’s household. Bung in a global recession for good measure and things seem pretty bleak. Then it got worse. What’s up, Mick? The post arrived on Monday and out of the two-for-one pizza offer junk mail fell a gaudy catalogue. Only it wasn’t a catalogue – it had “VOTE” written on it. Promotional blurb for the City Gardens Development. How profoundly depressing. The front ‘cover’ illustration is of some futuristic landscape from another place. Only on closer inspection it isn’t. It’s Aberdeen, or, more accurately, a version of Aberdeen which can only have be conceived in cloud cuckoo land. Real people, in a REAL garden. It’s lurid, horribly-coloured, glib and vacuous. It is pervaded by a complete sense of the unreal. Semi-transparent people wander aimlessly inside a cartoon-flowered version of reality. Children trample unrestrained, yet the flowers survive. Out-of-scale human forms laze in some sort of airborne meadow whilst below them, in a throwback connection to the real world, trade waste bins lurk ominously. A woman of Amazonian proportions accesses a laptop whilst sitting on surprisingly unbending grass stems. The remnant spire of the Triple Kirks emerges from a scrubland of low growth stock image shrubbery. It all looks vaguely ill-tended, neglected, as if within this futuristic vision lie the discards of the past. Or perhaps its a tacit admission that should, god forbid, this monstrosity go ahead, there is just no way that the upkeep will be affordable. Delving deeper, the background is found to comprise of a realigned His Majesty’s Theatre and a hugely-inflated and decapitated William Wallace. A victim of the guillotine perhaps? But the history, like the whole of this charade, is just plain wrong. Landscape dressed up as farce. A cityscape for Anywhereville. Inaccurate. Disjointed. A cut-and-paste pastiche. Opening up, things don’t improve. A drab labyrinth of pathways which look like bridges over a motorway, criss-cross manicured lawns and monoculture grasslands. In one image the sun sets….or does it rise? Either way, it’s in the wrong place. What on earth, if we are still on earth, is going on? This is lazy work, a Standard Grade project gone catastrophically wrong. Everything is confusing. The front page image shows a gaudy flower bed appearing to lie on a lower level of the structure. Moving inside the pamphlet the same floral, er…..’bombshell’, is miraculously elevated. Or is it that those bloody bins are just absolutely HUGE? I’m confused, disturbed even. I’m going to have a lie down, maybe I’ll feel better and ‘it’ will all have been a bad dream. Only it won’t. It isn’t. In the sunset image, an oddly-inclined piece of lawn totters precariously into the largely obliterated Denburn valley. In Woody Allen’s Manhatten, a character in a TV show is observed to have a toupee so badly-placed on his scalp that it looks like it has been dropped on to his head from a great height in an uncontrolled way. This elevated savanna has the same feeling about it. There will be a need for avalanche warnings in the snowy depths of winter. In another image, a pipe band plays beneath a Formica-lined dome with random cut-outs that give the feeling that the design is based on half a panelled football booted around Pittodrie of a Saturday afternoon. Below this, a winter scene shows people so cold they have started to vapourise as, it would appear, has the Formica football, associated terraces and denuded trees, miraculously large for such a recent planting. A lone child in a blue jacket has something so contagious that the populace in the foreground seek to distance themselves as quickly as possible. Is he the cause of the vapourisations? Oh I get it – we’re on the set of War of the Worlds and soon tattered clothing will rain down upon us from the sky. I know that was the only good bit. It all has an apocalyptic feel. I’m going to have a lie down, maybe I’ll feel better and ‘it’ will all have been a bad dream. Only it won’t. It isn’t. Aberdeen is a beautiful city, notwithstanding some recent disastrous architectural additions. It doesn’t need or deserve such ill-thought out attentions as this abomination. 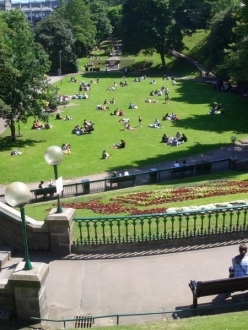 Union Terrace Gardens are an integral part of what allows Aberdeen to maintain its architectural, cultural and civic dignity. The Gardens need some tender loving care, but they don’t need annihalation by the ‘solution’ that this tacky pamphlet proposes. A heartfelt plea. Please, people, don’t let this thing go ahead. 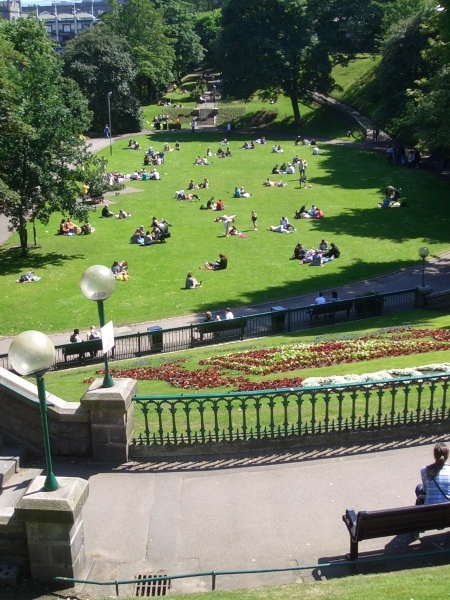 Make sure you vote to retain Union Terrace Gardens.